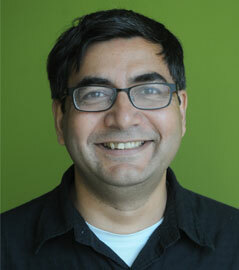 Rajesh Bhatt is professor of Linguistics at the University of Massachusetts at Amherst. He received his PhD in 1999 from the University of Pennsylvania. His research interests involve the syntax-semantics interface, the comparative syntax of Modern Indo-Aryan languages, and Tree Adjoining Grammars. Within the syntax-semantics interface, he has written on the interaction of aspect and modality, comparatives, and implicit arguments and within comparative syntax, he has worked on long distance agreement, closest conjunct agreement, and correlative constructions. He was part of the team that built the NSF funded Hindi/Urdu Treebanks. Prior to UMass, he taught at the University of Texas at Austin. He has also taught at the LSA Summer Institutes at MIT and at Boulder, the LOT Summer School, and LISSIM.